Fawns, Unicorns, Kittens, and Mice! The sweetest little animal headbands you ever did see!! Plus floral halos! on a metal headband that fits from approximately 3 years to adult. Super sweet dolly and me set in the Chasing Unicorns color mix! Pink, mint, turquoise, and gold for both your girl and her dolly bff. Girl headband is shown on a light pink ribbon wrapped headband and this style unicorn band works best on a ribbon wrapped headband. These headbands typically fit best from about age 3 to adult. Doll unicorn headband is shown on light pink glitter elastic and is sized for standard 18" dolls (or American Girl Bitty Babies). See second photo to see set being worn on Gracie and her Gracie doll! 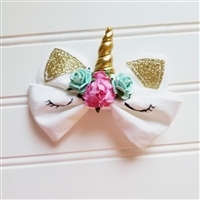 The sweetest little unicorn bow you ever have seen! Hand sewn with gold glitter ears, hand drawn eyes, a gold horn, and pink and aqua roses. Shown on an alligator clip, and can be seen being worn in the second photo. Elastic and hard headbands are both an option, however, please note that the bow will run the length of the elastic/headband, so the horn will point toward the back of the head. If choosing a hard headband, please note if you prefer to have the bow centered on the top or offset as a normal bow is worn.